The Millennium machine for the manufactured housing industry. The JADDE 2000 ushers in a new era in moving and set-up of manufactured homes. The JADDE 2000 was designed, built and perfected by house moving professionals. This sturdy built compact machine can raise or lower the housing unit and steer left or right. This greatly reduces the effort involved in maneuvering the housing unit around sharp turns and over various obstacles. The JADDE 2000 virtually eliminates bridging-cribbing-jacking and sideways rolling. Turn a 3-day job into a 3-hour job! 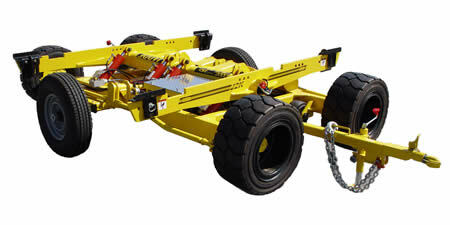 The JADDE 2000 consists of set of heavy duty steering axles and hydraulic lift wings attached to a high alloy steel frame. The steering axles are designed to allow sharp, precise maneuvering of the housing unit around sharp turns and for final placement on the foundation site. The hydraulic lift wings are adjustable in width and attach to the main frame of the housing unit allowing the operator to raise the tail end of the unit to clear obstacles and keep the tail from dragging. This virtually eliminates the time-consuming heavy labor involved in bridging and cribbing, saving you both time and money. The lift and steer functions of the JADDE 2000 can be operated either by radio remote control or by control panel attached to an umbilical cord. These capabilities combined with the best materials, workmanship and design ensure years of trouble free use. The best friend a manufactured housing mover ever had. The JADDE 2000 is easily transported from job to job behind a pickup truck. Once at the job site the travel wheels are removed and the unit is lowered onto its work wheels. Then the unit is attached to the main frame of the house to be moved (normally the two rear most axles are removed from the house and replaced by the JADDE 2000). The JADDE 2000 is hydraulically operated, and power for the hydraulic system is delivered via a deep cycle 8-D marine battery with built in quick charger. If kept properly charged, this battery will give many hours of good service. Wing Adjustment … 76" to 100.5"
Lifting Capacity … 56,000 lbs.